Learning to walk again after a traumatic accident is no easy task. One of the hardest things for motor-impaired patients is to generate the correct brain signals to help them recover efficiently. The current best option is physiotherapy: through hard work and frustration, patients gradually relearn the sequence of motor instructions required to sit, walk, stand and run again. In essence, they are rebuilding the damaged synaptic connections in their brain and spinal cord through active learning. But what if instead a healthy therapist’s brain signals directly modulated the patient’s brain, providing the necessary electrical patterns to induce learning? It may seem like a Matrix-esque, far-fetched idea, but a team led by Duke University’s Dr. Miguel Nicolelis is showing the first hint of evidence that brain-to-spinal cord physiotherapy may be possible in the future. The team presented their unpublished results at the 2015 Society for Neuroscience annual conference, which took place in Chicago last week. The study built upon the team’s previous work on Brainets, in which the brains of animals are connected via electrodes into functional organic computers. When challenged with an array of basic computational and visual tasks, the Brainet performed better than each animal alone. “We found that when the animals worked on the same computer-based task, their brain waves synchronized,” said Amol Yadav, a PhD student who conducted the current study. We think the neural activation pattern of one animal is influencing all others, he said. This made Yadav wonder: in a real-world, non-virtual setting, could one animal’s brain directly facilitate plasticity in the nervous system of another’s? To test this, he turned to an FDA-approved therapy called dorsal column stimulation (DCS), in which an electrode is implanted in a patient’s spinal column. DCS requires surgery, but it’s not as traumatic as you might think. After implantation, the pinkie-sized electrode rod nestles safely in parallel to the spinal cord and receives signals from an external pulse generator (a small device that triggers pulses of electricity). The pulses are then faithfully delivered to the ascending portion of the spinal cord, which passes the electrical information into the brain. Rather than sticking electrodes directly into the brain, we wanted to test something that was more clinically feasible, explained Yadav. DCS is currently used to treat chronic pain and Parkinson’s disease, and we know it’s safe. To start off, Yadav implanted electrodes into a group of receiver rats, and taught them to discriminate between two very different pulses: 100 rapid firing pulses, or one single pulse. 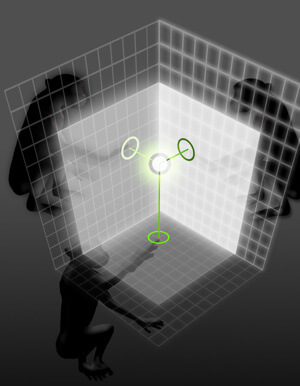 The two different simulations corresponded to two different behaviors: turn left and turn right, respectively. After only 11 sessions, the rats could tell the two apart with 95% accuracy. Then came the main deal. Yadav put an encoder rat into a box with two chambers. It was this rat’s job to learn how to do a particular task. The researchers then hoped to imprint this “encoded” learning into the brain of another rat by communicating a recording of its brain activity to the spinal column using the DCS pulse generator. To receive an award, the encoder rat had to enter an inner chamber, where the walls were littered with small metal bars that brushed its whiskers as it explored. In some cases, the bars were spread far apart — signaling the rat to turn left for a reward — or packed closely — signaling it should turn right. The encoder rat’s brain activity was recorded as it navigated the puzzle. These recordings were given a value between 1 and 101 depending on how often the metal bars brushed the encoder’s whiskers: Loosely placed bars (“turn left”) generated values below 50, whereas tightly packed ones (“turn right”) had a value above 50. This value was fed into the DCS system attached to the receiver rat and used to drive the pattern of pulses. Finally, the receiver was placed in the task box — minus the metal bars — and given the same option to turn left or right for the reward. Notably, the receiver rat had only been trained on two types of pulses, 1 and 100. For it to “know” which way to turn, its brain had to interpret this new set of pulses and understand that anything below 50 meant left, whereas above meant right. 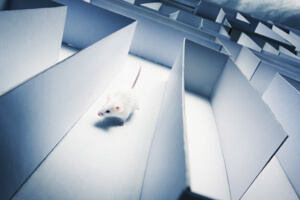 Yet within a dozen sessions, the receiver rat learned to correctly locate the reward around 70% of all trials, simply based on the “learning instructions” it received from the encoder rat. But considering the receiver had never been trained on the task, he added, a 70% “inception rate” is quite remarkable. As the rats learned, the team found interdependent adaptations in multiple brain regions involved in sensory and motor processing in both animals. “This really suggests to us that complex plasticity is occurring at the level of the Brainet,” said Yadav. That is, the brain activity of the first rat actually reshaped the second rat’s neural pathways to some degree, passing on physical learning from brain to pulse generator to spinal column—and then to the second rat’s brain itself. The study’s crazy fascinating, and it hints at what we may able to achieve one day with brain-to-brain assisted physiotherapy. But this Matrix-like learning is still far in the future — human brains are multitudes more complex than rat brains, and so far, the method’s only been used in two healthy rats. The next step is to repeat the experiment using a rat model of Parkinson’s disease as the receiver animal.